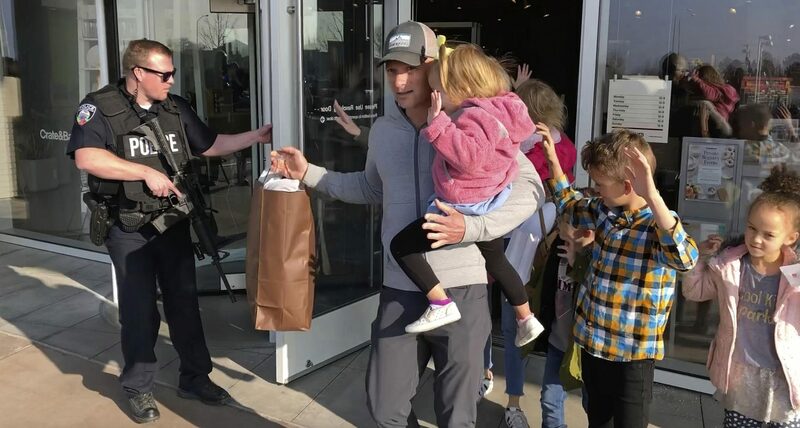 MURRAY, Utah (AP) — Two people were wounded in a shooting just outside a popular Utah mall Sunday where hundreds of scared shoppers hunkered down until police arrived to evacuate the building. Shoppers were escorted by police out of the mall holding their hands in the air. The mall is a highly visited shopping center in the heart of the Salt Lake City metro area with stores such as Crate and Barrel, Macy's and Nordstrom. Al Collins was shopping in Dillard's with his girlfriend when the fire alarm started blaring and someone on a loudspeaker said to evacuate. He started filming with his phone. "Right after I started filming, gunshots were right around the corner from me," he told The Associated Press. He kept filming as they ran out. Gunshots are heard in his video, along with his girlfriend crying. "I didn't even really know what was going on. I was pretty sure it was gunshots," he said. "I felt like we couldn't run fast enough to get out of there." Crate and Barrel employee Danielle Calacino told The Associated Press that she saw people running out of the mall after the alarm blared. She said 10 to 12 employees and around 20 customers hid in the store's upstairs stockroom. She said police escorted them out after about 40 minutes. Associated Press journalists Brady McCombs in Salt Lake City and Jennifer Sinco Kelleher in Honolulu contributed to this report.